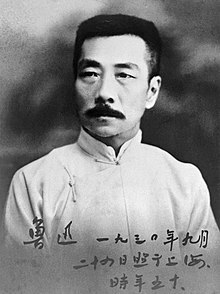 Lu Xun (25 September, 1881 – 19 October, 1936) , formerly romanized Lu Hsün, was the pen name of Zhou Shuren, a leading figure of modern Chinese literature. Writing in Vernacular Chinese as well as Classical Chinese, Lu Xun was a short story writer, editor, translator, literary critic, essayist, poet, and designer. In the 1930s he became the titular head of the League of Left-Wing Writers in Shanghai. 1.2 "The Epigrams of Lusin"
Translation: For all of ignorant people of a nation, even if their body is somehow strong, somehow grand, even then they can only make meaningless displays [of this "strength"]. [As for] the multitude of constituents and observers, however many may die from [this] sickness, this is [still] not to be considered as unfortunate. Note: Lu Xun studied medicine before he became a writer. Once he saw on a film a Chinese being executed by Japanese while many other Chinese were watching this "spectacular event". This made him feel that saving the "souls" of people is more important than saving their bodies. Translation: Chinese medicine lies, whether purposefully or not. Translation: Chinese tend to love moderation because of their temperament. If you said, for example, the room is so dim that there is an window to be installed here, no one would agree. But if you intended to dismantle the roof, they would come to mediate and therefore would agree to install a window. Translation: "Soviet Union is under dictatorship of the proletariat, the intelligentsia class is going to be starved to death. "...a well known reporter had so warned me. Yes, I am afraid I might lost some sleep. But then, dictatorship of the proletariat(at present), isn't it for the forth coming of the classless society? As long as you do not murder it, naturally it's success will arrive soon, the elimination of classes will arrive soon, then no one will be "starved to death"...But now, the imperialists and their running dogs, still trying to tell us the Soviet Union's shortcomings, as if they really wish that Soviet Union would become heaven overnight, and all of it's people would enjoy life. Now, it turns out to be like that, it (imperialist) is disappointed, and feel uneasy...This is really the tears of the devil. Translation: Verbal abuse and intimidation are not fighting. Translation: The Revolution is so that people can live, not so that they can die! When you talk with famous scholars, the best thing is to pretend that occasionally you do not quite understand them. If you understand too little, you will be despised; if you understand too much, you will be disliked; if you just fail occasionally to understand them you will suit each other very well. The so-called "peace" is an interval between wars. I used to think that a man was sentenced to death or imprisonment because he was guilty; now I know that he is found guilty because he is disliked. Chinese people love compromise. If you say to them, "This room is too dark, we must have a window made," they will all oppose you. But if you say, "Let's take off the roof," they will compromise with you and say "Let's have a window." Rather than worship Confucius and Kuan Kung, one should worship Darwin and Ibsen. We have hereafter only two roads to choose: one is to embrace the ancient literature and die, the other is to forsake the ancient literature and live. The literature of former days is like watching a fire from across the water; in present-day literature, the author himself is being scorched by the fire and he is bound to feel it deeply, and when he begins to feel it deeply, he is bound to take part in the social struggle. This page was last edited on 7 August 2018, at 10:04.